We've been spending a lot of time outside this summer enjoying our backyard patio. The kids have had a great time playing with our Boxer puppy during these warm weather months. 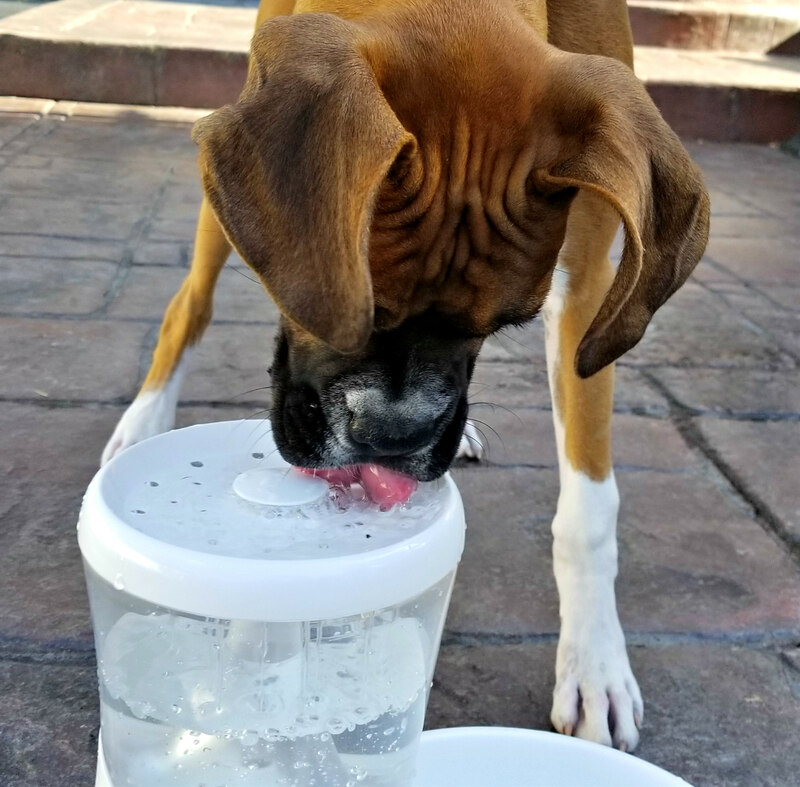 Of course, being outdoors that much involves the responsibility of making sure there is enough water available to keep our dog healthy and hydrated while spending time with us. Water though can get stagnant when just left out in a bowl throughout the day. 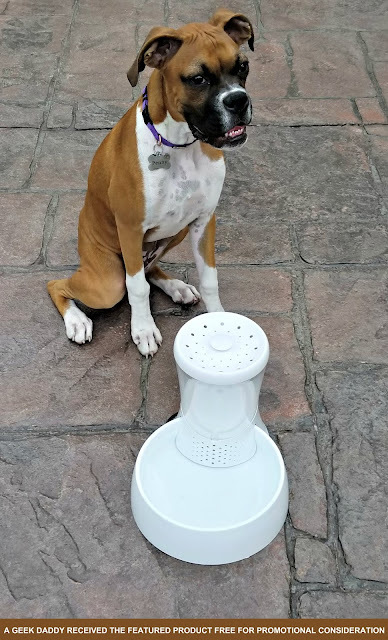 We found a convenient way to provide our puppy with fresh water all day with the Petmate Fresh Flow Rain Fountain. 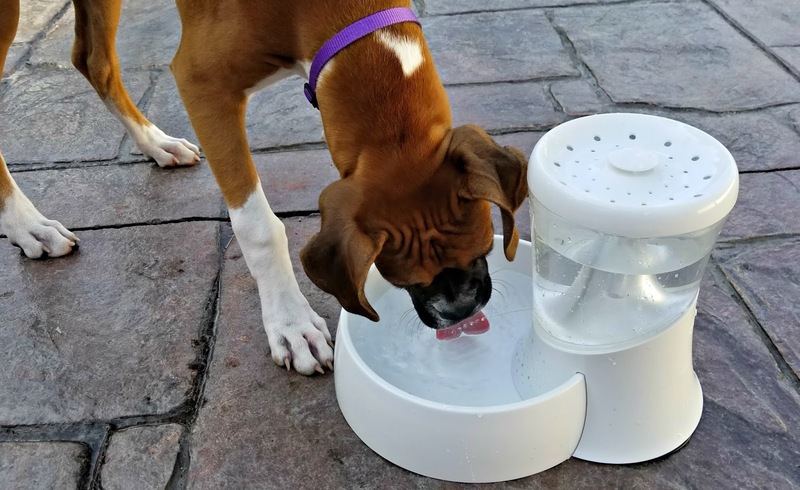 The Petmate Fresh Flow Rain Fountain circulates water to avoid it becoming stagnant in the drinking bowl. When the bowl is at its full mark, water starts to be pumped up to the top of the fountain where it then rains down into an upper see-through chamber. 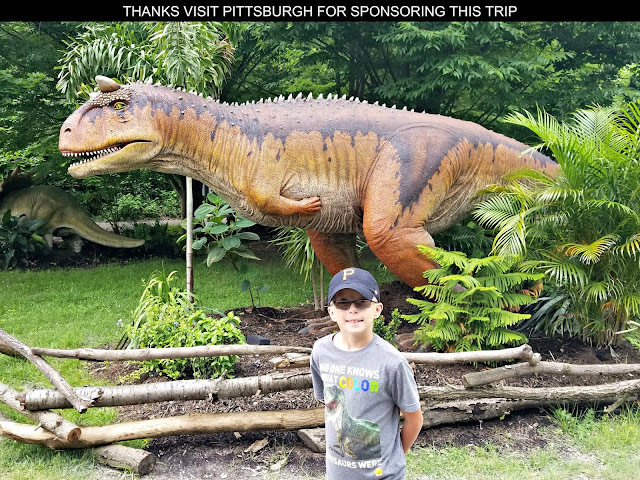 This rain like flow perks pets' natural curiosity and entertains them as they watch it swirl from the fountain's top down through an upper water chamber and back into the drinking bowl. Our dog is clearly amused watching the water circulate through the Petmate Fresh Flow Rain Fountain. 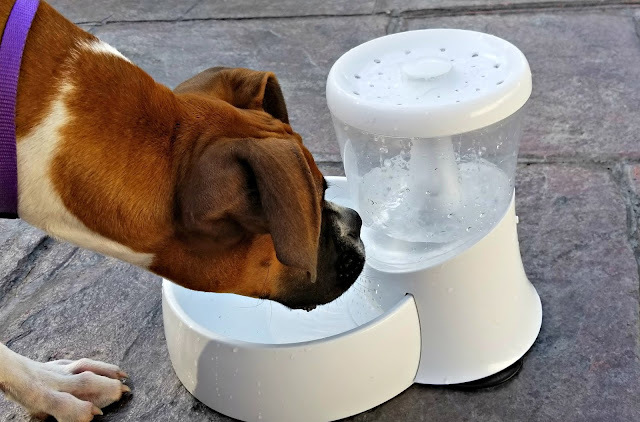 This electronic dog water bowl is 100% battery powered so it is portable to move around inside and outside no matter whether or not you have access to a power outlet. The fountain's water reservoir and pump are self-balancing so that gravity has water constantly flowing. So the pump only has to run half the time. This allows the fountain to run for months powered simply by four D-cell batteries (not included). There are two spots for an animal to drink from. Our dog likes to lick the top of the fountain as water is pumped out from the drinking bowl and trickles down into the upper chamber. An ongoing stream of water also drops from the upper chamber into the drinking bowl. Some pets will enjoy to slurp the stream of water as it drops into the drinking bowl while others may prefer sipping from the drinking bowl itself. We find our puppy regularly rotates among the various drinking options during the day while we keep the Petmate Fresh Flow Rain Fountain running for her. Dogs do so much to enrich people's lives and the Petmate Fresh Flow Rain Fountain is a nice way to make your pet's life better. 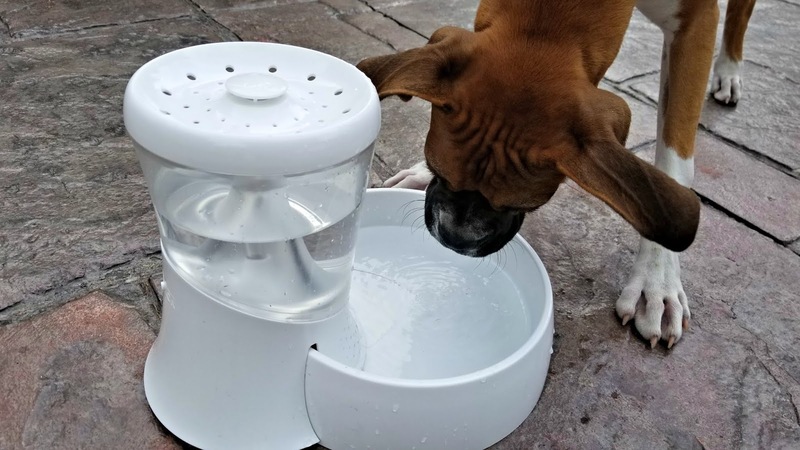 With visual stimulation that will captivate both cats and dogs and a circulation system with replaceable charcoal filters that helps keeps drinking water fresh and clean, a Fresh Flow Rain Fountain is a great way to keep your pet happy and hydrated.